Is there a cost savings going with a prefabricated structure? The follow-up question almost always related to cost savings. It has been our experience that a prefabricated structure may provide cost savings, including the architectural and structural engineer design fees that may be required for a custom designed park shelter. What’s easier for the contractor? The third most asked question is generally around installation or construction of the park structure. The construction practices for both approaches are often the same. Both approaches provide a full set of plans that can be used for permitting, bidding, and construction. 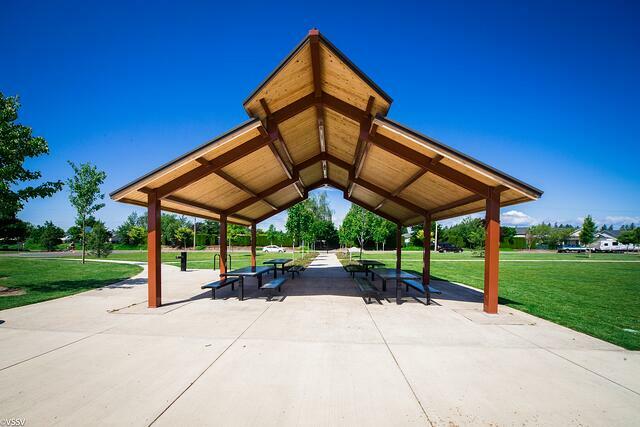 The benefit of selecting a park shelter fabricator is that they often make it easy by providing all the materials to the job site in one shipment for assembly, reducing coordination time for the contractor. Some of the issues that need to be evaluated before deciding on either approach revolve around coordination of interim submittals and permitting. With both approaches, you’ll need to make sure that the team understands the deadlines and what will be required for permitting. However, with a prefabricated park shelter you will have some extra time involved for coordination that typically an architect would provide. For example, you will need to provide the required building permit information to the fabricator such as snow load, wind speeds, and soils information. Another common issue when it comes to the prefabricated shelters is lead time. The shelter fabricators typically do not have the ‘kits’ readily available like you’d see at IKEA. They fabricate when the order is placed and payment is made. Depending on how busy the fabricator is, this may take up to several months and may affect your project schedule. A custom design shelter places this coordination on the contractor. A final consideration involves material selection such as wood versus metal structures, roofing materials and color, trim applications, and veneers in case you want to incorporate cultured stone on the columns or walls. With a custom designed shelter the architect will lead you through this material selection process and provide recommendations. If design aesthetics and material knowledge is not in your wheelhouse, it is helpful to have a professional work through these items with you. It really depends on your time commitments and cost implications. The reality is, there is not a right or wrong decision with either approach; Both scenarios should be able to provide you with a park structure that will meet your constituents needs. Most importantly, make sure you go through this evaluation process with your design professional or shelter fabricator so that you fully understand the benefits and constraints of either system.